read a word of Proust. And having then worked myself in my mind into the strategic strongpoint that I desired to occupy I at once bought a copy of "A Cote de Chez Swann." I read it and "A la Recherche du Temps Perdu," in one weekend at Guermantes and I found in Proust's work all the supernatural hypnosis that his most devoted followers obtain from it. But I do not think I have imitated him since. . . . When he heard me say that I had read no Proust he confirmed for me a story of his meeting Proust that I had heard from the lips of the lady in whose house it had happened. Let her be called, in honour of another novelist, Mrs. Leo Hunter. .. . 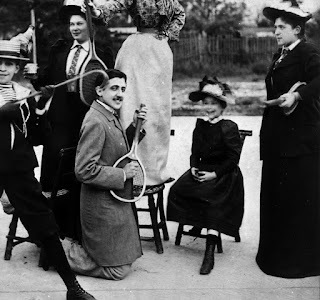 The lady had asked Joyce to a reception to meet Proust. Joyce, knowing nothing of Proust's habits and no hour having been named, attended at about eleven. Proust in those days rose at four in the morning. But in honour of Mr. Joyce he had got up that night at two and arrived about two-thirty. Mr. Joyce was then tired. Two stiff chairs were obtained and placed, facing the one the other, in the aperture of a folding doorway between two rooms. The faithful of Mr. Joyce disposed themselves in a half circle in one room; those of M. Proust completed the circle in the other. Mr. Joyce and M. Proust sat upright, facing each other and ver-tically parallel. They were incited to converse. They did. Said M. Proust: "Comore j'ai dit, Monsieur, dans 'A Cote de Chez Swann' que sans doute vous avez lu. . . ." Mr. Joyce gave a tiny vertical jump on his chair seat and said: "Non, monsieur. . . ." Then Mr. Joyce took up the conversation. He said: "As Mr. Blum says in my 'Ulysses,' which, Mon-sieur, you have doubtless read. . . ." M. Proust gave a slightly higher vertical jump on his chair seat. He said: "Mais, non, monsieur." Service fell again to M. Proust. He apologised for the lateness of his arrival. He said it was due to a malady of the liver. He detailed clearly and with minuteness the symptoms of his illness. ". . . Tiens, monsieur," Joyce interrupted. "I have almost exactly the same symptoms. Only in my case the analysis. . . ." So till eight next morning, in perfect amity and enthusiasm, surrounded by the awed faithful they discussed their maladies.